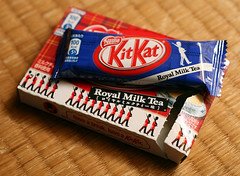 Royal Milk Tea sounds very posh, doesn’t it. 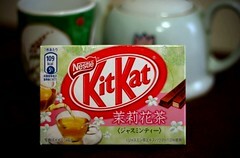 ‘Fragrant black tea with milk’ might be fierce exotic if you’re Japanese, but if you’re English, it’s simply a cuppa. 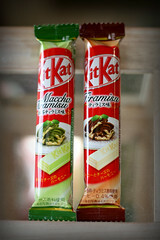 There is a hint of PG in there but because the Japanese emphasis is on the milk, it’s white ‘chocolate’, alas. Nowt special, except look! – there’s tartan and Queen’s guards on the box. Alright, extra point for that. If you’re the kind of person who likes their tea to taste of flowers, then you’ll probably not object to chocolate that tastes of tea that tastes of flowers. You follow? Fortunately, white chocolate just wouldn’t suit the flavour, so it’s a welcome return to milk chocolate. Sighs of contentment all round. Very nice and all that, but be honest, it’s one for the girls, isn’t it. 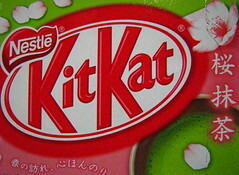 As a prelude to the imminent and inevitable sakura KitKat, there’s a distinctly feminine feel to spring. A special set for your tea- or coffee-break. 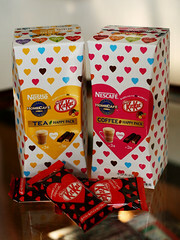 Each pack contains 3 packs of differently flavoured coffee or tea, and 3 raspberry and passion fruit, plain chocolate KitKats. Everything your breaktime needs. 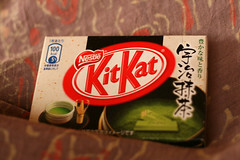 Not green, but brown tea flavour. And a nicely subtle flavour, at that. 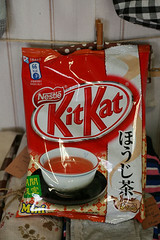 Goes perfectly within a mid-afternoon cuppa, so unfortunately, a whole bag doesn’t last very long.